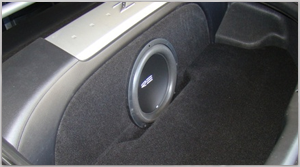 Custom sub boxes make it easy to add bass to your vehicle. We stock a huge range of custom subwoofer enclosures that fit the most popular vehicles. All of the boxes we sell are tested to ensure a perfect fit. Most of the custom sub boxes we sell fit into wasted space in your vehicle, so you wont even notice that they are there. Most shops will charge you quadruple the price for the same result. Buy them here for a fraction of the cost.